A poster of John Graham of Claverhouse, Viscount Dundee, that I bought on Ebay and had box-mounted recently. 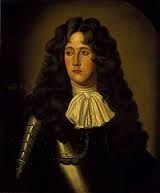 He led the first Jacobite rising in favour of James VII, but was killed at the battle of Killiekrankie, which he won. He was known as "Bloody Clavers" by the Covenanters and as "Black John of the Battles" by his Highland followers. Scott wrote him as a villain in his novel, Old Mortality, but later wrote the poem, Bonnie Dundee, about him. I don't expect everyone to know Scottish history!